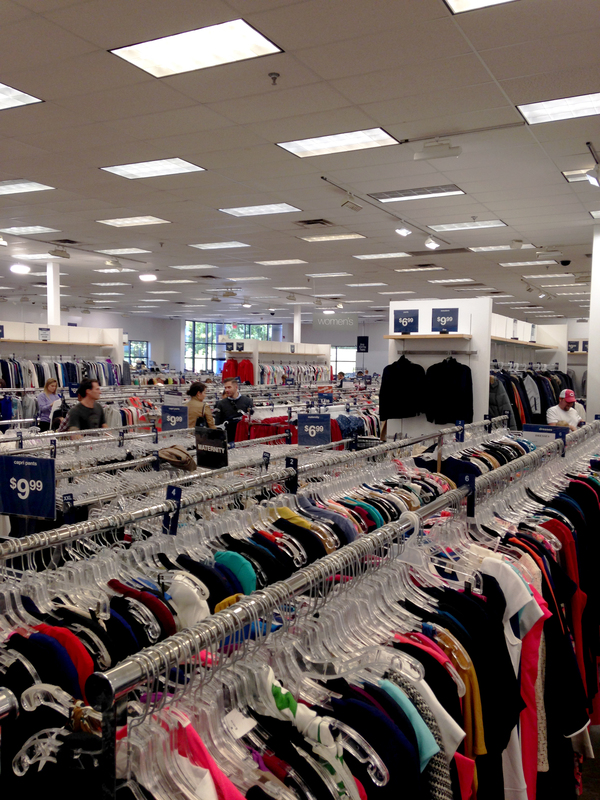 When my husband and I knew our days in Kentucky were officially numbered, I realized the one adventure I had yet to check off my “Living in Louisville” mental bucket list: shop the Gap Clearance Center. 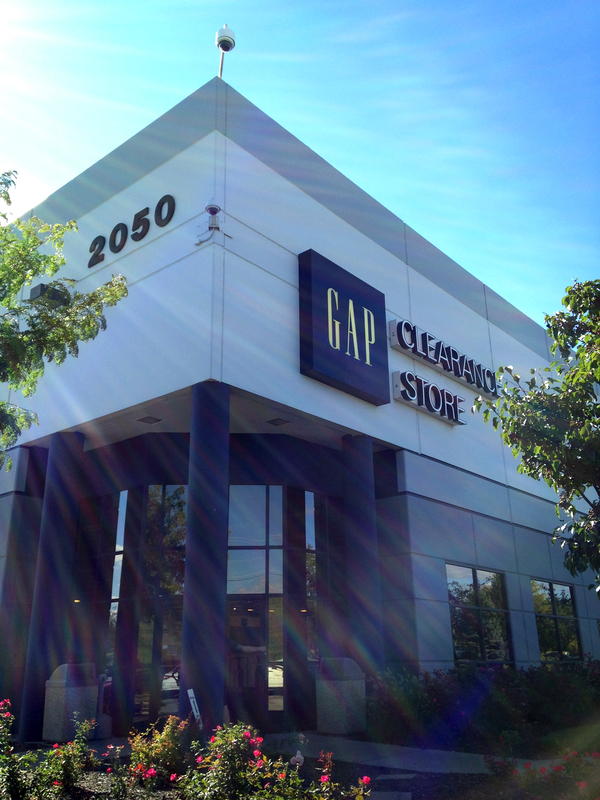 Oh what is the Gap Clearance Center, you may ask? I had no idea, either, because it’s the only one in the world and I had just found out about it. Yes, world. The whole world. We had been sharing a state, and I had yet to visit. It felt like brand betrayal. Because Austin and I didn’t see ourselves back in the Bluegrass state anytime soon, I simply had to make time for a quick solo road trip. My last free weekend before the move, I made an hour and a half jaunt to Hebron, KY. I stretched my legs, slung on my purse, and swung open the big, glass, industrial double doors not knowing quite what to expect, completely excited, and immediately completely overwhelmed. It’s not an outlet or factory store. Essentially, it’s a dumping ground for all products in the company that were damaged, made defective, overstock, or simply didn’t have any luck selling. There was a ton of stuff with absolutely no issues, mixed in with a ton of stuff with a lotta issues. 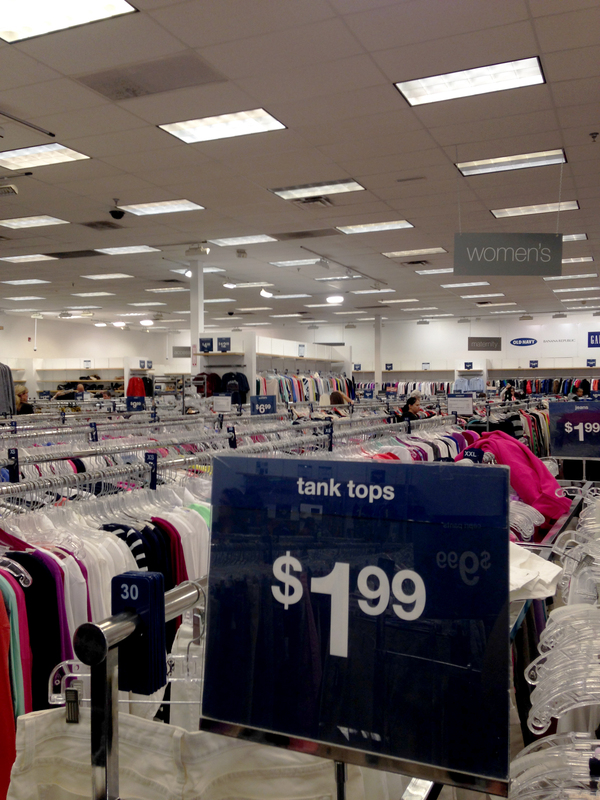 Think giant, Walmart-sized department store with the organization of a Good Will filled like the Island of Misfit Gap Garments. I had found my Mecca. If you like your shopping experience to be neat, tidy, organized, and have everything you’re looking for presented in front of you sized, sorted, and handed to you through the fitting room door –this is not your place (and there’s nothing wrong with that. This is one trip ill-advised for the faint of heart or inexperienced shopper.) Items were organized by type (tanks, sweaters, pants, shoes), store, and generally size, but it was a true treasure hunt from there. I have a rule of thumb when I shop -I never use a cart. If I can’t carry it, I shouldn’t buy it, simple as that (you know, except for groceries.) That’s how I began this journey, and half an hour in I caved under the pressure of ten thousand tons of fabric & buttons. Shuffling my two little, overflowing arms to the carts, a knowing grin from a nearby sales associate told me I hadn’t been the first who thought I could tackle the store alone, and wouldn’t be the last. This was about to get serious. It was essential to try on absolutely everything -hence the necessity of a cart. 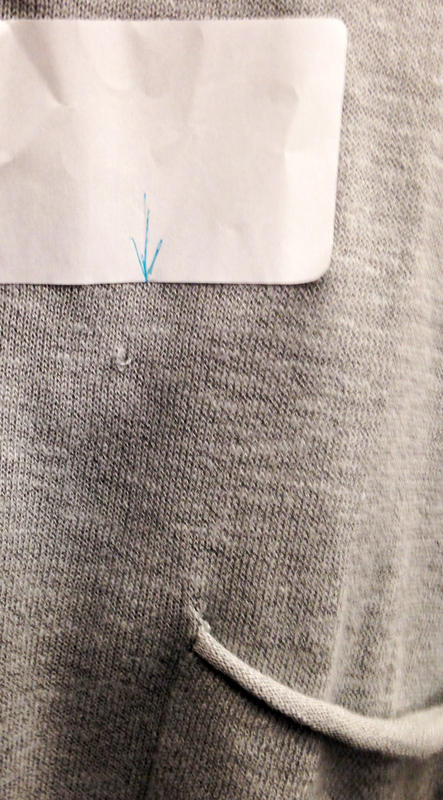 A pair of trousers could be labeled “6-Tall” and one leg in fits more like a “2-made for American Girl Dolls.” One arm of a sweater might be longer than the other, the buttons might be off, or the zipper may be busted. Practically everything was a gamble until you hit the fitting room. They do have these nifty labels for seriously obvious damages like snags & stains to help not waste your time. They also had a sort of tag marker labeling system: “D” for damaged so you know to look out, a silver line for everything’s fine, and a mysterious red line that I have no idea what it meant. 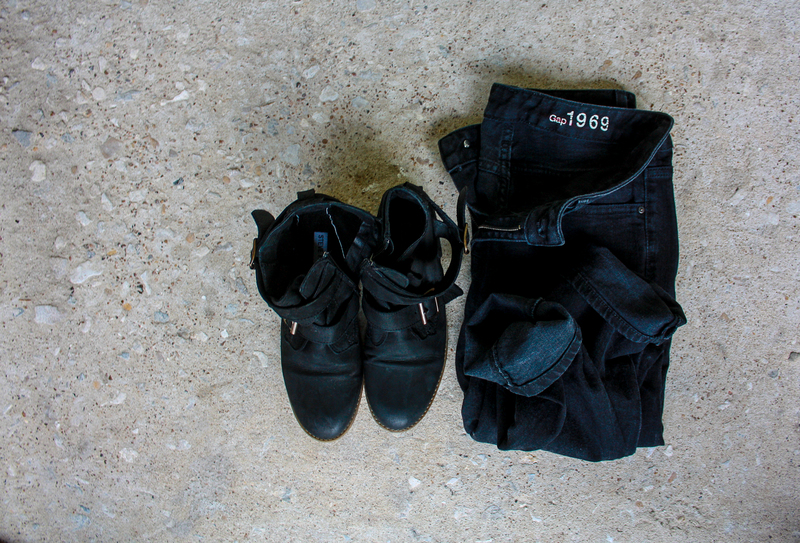 I mostly ignored the system and opted to try things on and investigate myself, instead. It seemed safer. 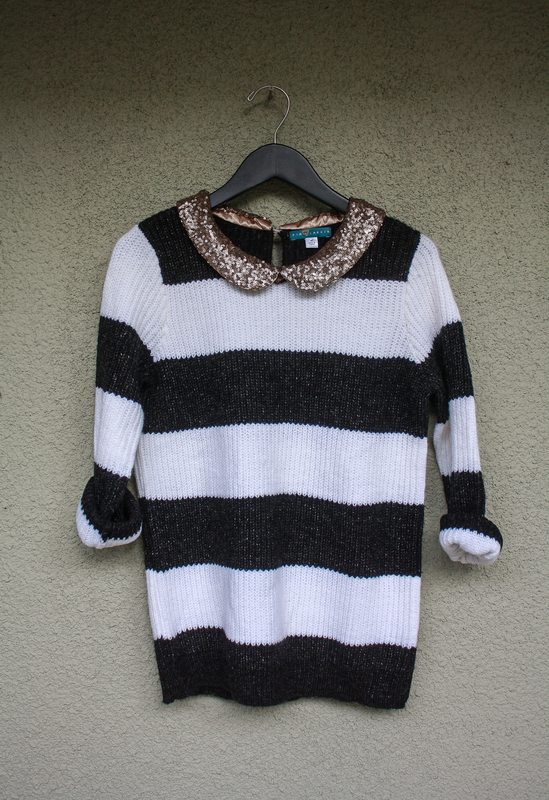 I was more than thrilled with the gems I found -particularly a $78 Pim + Larkin sweater I had been in love with from Piperlime the previous winter I scored here for $19. If you happen to be a Gap-obsessed, shopping-lunatic like myself and land somehow in Northwestern Kentucky with some spare money & time, I highly (obviously) suggest at least a quick run through (if quick is actually even possible. )Something tells me this place is seriously, seriously hit or miss, and happen to be hit for me. I would say it’s worth the chance as maybe not a huge time-saver, but a massive money-saver. New-Wife, New-Home Instant Gratification Syndrome: Fall Edition! Robin Lynn, Robin Lynn, As much as I miss your smiling face every morning over a cup of coffee and booey-booey muffins, I do not miss your clothes, shoes, and jewelry which took up 3 full closets at home !!! I was laughing while reading this. I could just picture it. I bet your heart was racing while you were writing it ! 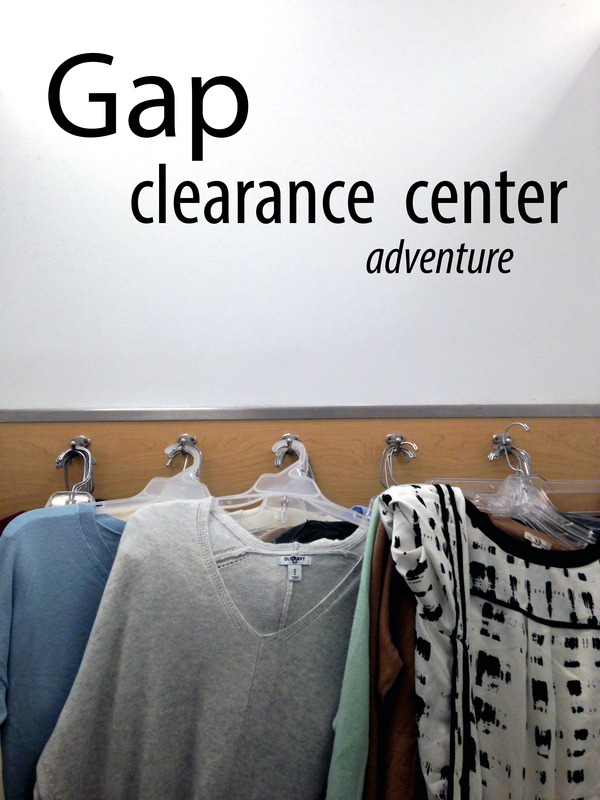 Nothing more fun than an adventure at the Gap Clearance Store–IMO the best thing about Cincinnati (OK, Northern KY)!